The Nave of St George’s Chapel was started by 1483 and roofed by 1496, although the magnificent stone vaulting was not completed until 1528. See the Nave virtual tour fullscreen (link opens in a new window). 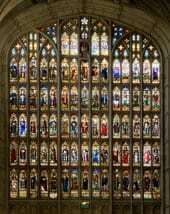 The West Window, said to be the third largest in England, contains seventy five lights of which sixty five pre-date 1509. 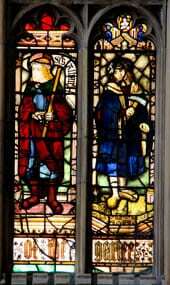 The right hand detail depicts William Virtue who was the Master Mason responsible for the construction of the Chapel and is probably the work of Barnard Flower, King’s Glazier (1505-1517) to Henry VII and Henry VIII. Situated in the north transcept of the Chapel, The Rutland Chantry was founded by Sir Thomas St Leger in 1481. He was brother-in-law of King Edward IV and was executed in 1483 by command of King Richard III. He and his wife are commemorated by a copper plate on the north wall. 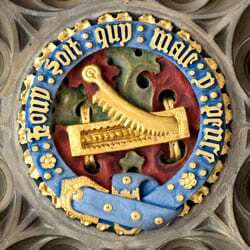 In the centre of the chantry is the tomb of Lord Roos, who died in 1513, and his wife Anne and daughter the Duchess of Exeter. 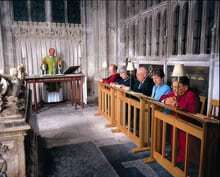 The Rutland chantry is frequently used for services. The furniture was presented by the Scout Association in 2007 to mark its centenary. 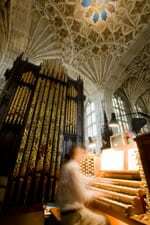 The present organ loft was built during restoration works in the reign of King George III. The design was by Henry Emlyn and sits on a screen constructed from an artificial stone called Coade. The entrance to the Quire is through the Organ screen from the Nave. 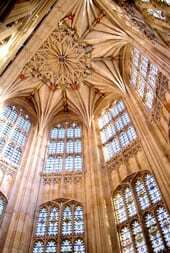 Situated in the south transcept of the Chapel, this chantry is the burial place of Sir Reginald Bray. 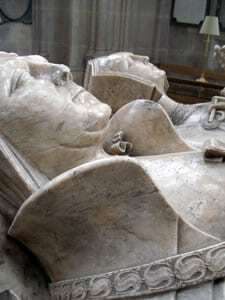 He served as a minister of King Henry VII, dying in 1503. At this time the construction of the Chapel was far from complete and following instructions in his will his executors enabled completion of works. As the works were completed they were commemorated with the Bray badge (a hemp-brake; a machine for crushing hemp). It appears 175 times in stone and metal throughout St George’s Chapel.